Who Is the Citi / AAdvantage Gold World Elite Card Good For? The Citi / AAdvantage Gold World Elite MasterCard has the smallest annual fee and least benefits of all the co-branded American Airlines cards offered by Citi. However, if you’re primarily interested in getting the sign-up bonus, or if you’re just looking for a solid introductory card that earns American miles, it might be for you. While the AAdvantage Gold card comes with some benefits and a solid 25,000-mile sign-up bonus, you won’t get all of the perks you might expect from a co-branded airline card. American Airlines’ purchases don’t earn bonus miles, checked bag fees are not waived, priority boarding is not included and you will be charged foreign transaction fees. If you want those perks, you’ll have to step up to the Citi / AAdvantage Platinum Select MasterCard. What you do get with the Gold card, though, is nearly the same sign-up bonus as the Platinum card, access to American’s Reduced Mileage Awards, and some cardholder benefits that typically come with more expensive cards, such as lost and delayed baggage protection, worldwide rental car insurance and trip cancellation protection. The AAdvantage Gold card comes with a 25,000-mile sign-up bonus. To get the bonus, you have to spend $750 within three months of getting the card. You can use your miles to purchase flights through the AAdvantage program. Since American Airlines is a oneworld member, you can book flights on the alliance’s 14 member airlines and their 21 affiliated carriers. Alliance members include British Airways, Cathay Pacific, Air Berlin, JAL and Qantas, among many others. American also partners with nine non-alliance carriers, including Alaska Airlines, Etihad Airways, Hawaiian Airlines, WestJet, Tahiti Nui, Fiji Airways, Seaborne Airlines, Gulf Air and Cape Air. American offers four levels of award flights: Off Peak, MileSAAver, AAnytime Level 1 and AAnytime Level 2. Off-peak awards are the cheapest, but they are only available in economy class on certain routes and during specific time periods. There are some good redemptions available at the MileSAAver level too, but you should avoid AAnytime awards because of their high cost. For example, you can get a round-trip ticket between the U.S. and Europe for only 45,000 miles off peak and for 60,000 miles at the standard MileSAAver level. AAnytime awards are very expensive for that route and start at 95,000 miles. For that price, you’d be better off paying cash or flying with someone else. The full list of off-peak dates is available on American’s website. The 25,000-mile sign-up bonus that comes with this card is enough for one domestic round-trip flight in economy at the MileSAAver level. You could also get to the Caribbean, Mexico or Central America during off peak dates for the same price. American introduced short-haul domestic redemptions with its latest update to the AAdvantage program. You can fly for as little as 15,000 miles roundtrip for destinations less than 500 miles away. What makes American’s domestic awards more attractive is that you can purchase one-way award flights for half the price of roundtrip tickets. That means you can complete your itinerary with another carrier if there aren’t seats available at the lowest rates from American. 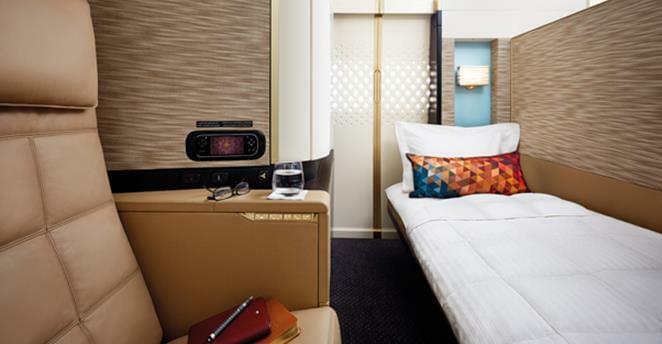 In addition to offering excellent off-peak and short-haul bargains in coach, AAdvantage miles are good for booking first class dream flights aboard American’s partner Etihad. While the redemptions aren’t the cheapest, they’re worth it if you want to experience the ultimate in luxury. New York to Abu Dhabi, for example, is 115,000 miles one way, but that’s in Etihad’s first class apartments. You’ll get to fly in your own room, complete with an armchair and separate bed. You can even schedule an in-flight shower. Etihad award flights can’t be booked online, so you’ll have to call American.